Sergei "Alexander" Nelke was born on 14 December 1894 in Vihula, Reval, Estonia. His ancestry was Finnish. The first mention of him in U.S. records is his WWI draft registration card, which was completed on 1 August 1917, and notes he was tall, blue eyed and had light color hair. He had arrived as a seaman on the ship Brosund shortly before that, and the ship's passenger list gives his height as 5' 8 1/2" and weight as 200 lbs. Other records indicate that he worked as a ship's carpenter for as long as 17 years. His brother, Waldemar "George" Nelke arrived in the U. S. about the same time, also employed as a ship's carpenter, but married a Finnish woman named Lillian, soon after, and worked as a maintenance man in a bank for many years. Records for George Nelke have helped to confirm the identity of Alexander Nelke. The WWI draft registration cards of both men mention that they were supporting a mother and sister in Russia, likely in Estonia. Alexander Nelke appears as a sailor on several ship's passenger lists before 1930. He does not appear in any census records, so likely worked as a sailor or traveled before 1940. His 17 year career as a shipboard carpenter is mentioned in the "New Yorker at Large" column of the Morning News of Florence, South Carolina on 17 June 1936. The subject of this column was the Washington Square annual outdoor art show. Nelke is mentioned as an exhibitor and one of the "handful of surprising personalities" of the show. 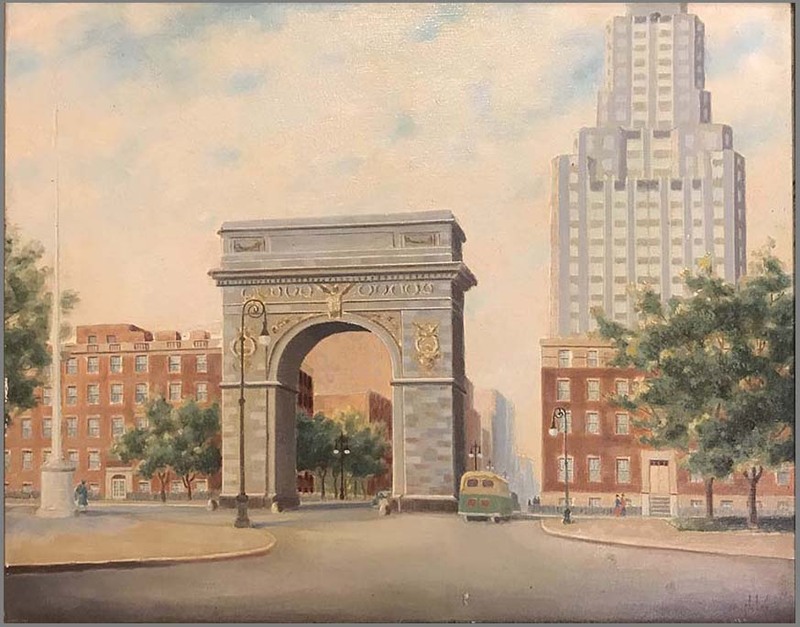 Nelke is referenced as a member of the Washington Square Outdoor Association in the Supplement to Mallett's Index of Artists. He worked as a commercial artist and his work was often reproduced at prints. Nelke exhibited at the Salons of America in 1934 & 1936 and with The Society of Independent Artists (SIA) in 1934, 1936, 1938, 1940 and 1944. The record of his address on Baltic Street in the records of the SIA matches the address on his WWII Draft Registration card and 1945 Naturalization record. Both of these records give his full name as Sergei Alexander Nelke, though he signed as Alexander Nelke on his draft registration card. Nelke is also mentioned in Davenports Art Reference and Price Guide. Details regarding his training as an artist are not known. Nelke died in Brooklyn, New York in August 1974.